If you couldn't tell from the gory, truly insane trailer, Overlord is a f*cking blast. 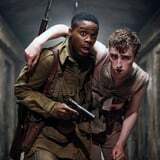 The film follows a group of World War II soldiers who find out during a mission in Nazi-occupied France that the Germans are engaging in some seriously gruesome experiments, some of them supernatural. So you can probably assume that there's plenty of blood and bone snapping throughout. What you might be wondering, however, is if the horror thriller has a postcredits scene, which is what we can help you out with.